In case you didn't know, Peter Hook is the former bass player of Joy Division and New Order; he previously documented the history of Joy Division in his book "Unknown Pleasures - Inside Joy Division" and in October 2016 the long-awaited follow-up "Substance: Inside New Order", is due to be published, which will be a must-read, if its predecessors are anything to go by. 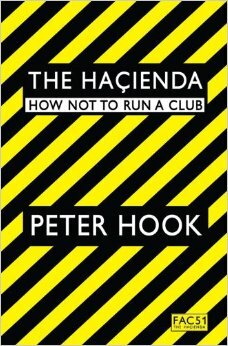 So I thought it would be a good idea to rewind to 2009 when Hooky published his first book about the famous Manchester nightclub. In the 1980s, Factory Records decided to diversify its interests and open its own nightclub: The Hacienda. New Order co-owned the club and kept on ploughing money into a venture which on reflection was way ahead of its time, Hooky was not only a shareholder in the club but also a regular attender through thick and thin, so he's certainly qualified to write this very detailed story - every chapter includes a full list of the DJs and their playlists, and the acts who appeared at the club, year after year - and even the club's accounts are, well, accounted for. As with his Joy Division book, Hooky writes in an appealing down-to-earth and unpretentious style, so don't expect any deep literal journalistic analysis here: instead there's lots of plain speaking and fondly remembered anecdotes. And there's certainly no airbrushing as he tells the story of the club's ultimate downfall, as the euphoric age of acid house gives way to the arrival of gangsters, guns and drug overdoses, and a constant undercurrent of violence. As the book's title suggests, The Hacienda wasn't the most professional business model, and whilst reading this book you will ask yourself how the club managed to stay open for so long. But then again Factory was no ordinary record label so it follows that The Hacienda (which like all Factory releases even had its own serial number, FAC51) was no ordinary club. Hooky however warmly acknowledges the various unsung heroes who kept the club running from day to day despite all the pitfalls along the way. "The Hacienda - How Not To Run A Club" certainly lives up to its title, highlighting a business model which probably shouldn't be emulated. But there are many entertaining anecdotes along the way, and this book should be treasured as a historical snapshot of a time long gone, but also a time which meant so much to so many.